Peter Helck (1893-1988) was born in New York City, in the same year the Duryea Brothers built the first American automobile, 140 miles away in Springfield, Massachusetts. During his life, Peter produced more than 600 sketches, drawings and paintings. They grace private collections and museums, including the Metropolitan Museum of Art in New York, the Congressional Library in Washington DC, the Carnegie Institute in Pittsburgh, the Philadelphia Museum of Fine Art, and the Long Island Automotive Museum in New York. At Pebble Beach in 2006, "A Motor Race On The Continent in The Early Days" sold for over $100,000 — a record for automotive art at auction. 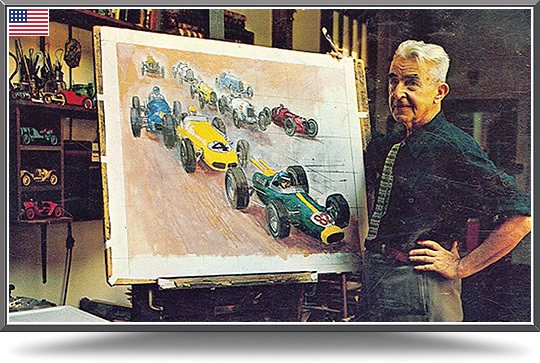 A founding member of the Automotive Fine Arts Society, Helck was dubbed “the dean of American automotive illustrators of the 20th century.” The society’s Peter Helck Award is their highest honor, given annually at the Pebble Beach Concours d’Elegance to the artist whose work represents the pinnacle of automotive fine art. "I am sure I wanted to be an artist from the beginning. Even before 1900 I was drawing locomotives and trains. Then came the automobile. In 1903 one of these contraptions parked at any curb was immediately surrounded by the inquisitive of all ages. If left unattended, the juveniles kicked the tires, explored the controls, honked the bulb horn and then scattered swiftly upon the return of the owner or chauffeur. All cars in motion were greeted by young voices bawling 'Get a horse!'" Helck developed an early interest in automobiles and became an avid fan of motorsport. As a young boy he got rides with race car driver Al Poole testing the latest cars from Simplex. The first race he attended was the 1906 Vanderbilt Cup on Long Island. In 1912 he studied art at the Art Students League in Manhattan (befriending fellow student Norman Rockwell), and spent many a lunchtime gazing at cars in nearby showrooms. An early influence was the 'grandfather' of automotive art: the legendary French artist Edouard Montaut, who depicted speed through exaggeration. He later studied in England with muralist Frank Brangwyn. A source of realism was that he painted on the spot, not from photographs. His first published work was for the Brighton Beach Motordrome and commissions for the Sheepshead Bay Speedway soon followed. From the 1920s through the 1940s Helck was a very successful magazine illustrator and advertising artist, acquiring innumerable awards and recognition. His commissions frequently were of industrial scenes, or featured cars, trucks and locomotives. During that period he also painted pictures of famous automobile races. Helck worked for most of the major car magazines of the day, in particular The Autocar, which took him to England and to major races in France and Italy. In the 1930s he was commissioned by the Sinclair Oil Company to create a five paneled road map. The result was a portfolio of lush service station scenes which did much to promote the idea of driving for pleasure. A big break came in 1944 with a series of eight paintings for Esquire magazine, in which he recreated the excitement of automobile races from the first decades of the 20th century. To his great satisfaction, these pictures proved very popular, and in the following decades he developed a large market for paintings of old cars. By the time of his passing at age 95, he had witnessed motor racing from its earliest beginnings, when men drove huge machines at tremendous speeds over rock strewn roads, to rear-engined single seaters on modern tracks. He knew drivers from Louis Wagner to Mario Andretti and his paintings documented their exploits as none before or since. Helck once said, "Perhaps the greatest satisfaction has come from producing paintings, drawings and sketches for the heroes of my boyhood, the speed kings of their day, whom I later came to know." He was one of the founding faculty for the Famous Artists School, wrote many articles and authored two books: The Checkered Flag (Scribner, 1961) and Great Auto Races (Abrams, 1975.) In 1968 he was elected by the Society of Illustrators to its Hall of Fame artists for his "distinguished achievement in the art of illustration."